Imphal, September 07, 2013: Manipur state dancer Gurumayum Chandan Devi received the Sangeet Natak Akademi Ustad Bismillah Khan Yuva Puraskar 2011 award today in New Delhi . The reward carries a citation and a cash prize of Rs 25,000. A total of 32 artistes in various fields including dance, music, theatre, traditional folk, tribal dance and puppetry were given recognition by Leele Samson, Chairperson of Sangeet Natak Akedemi. Gurumayum Chandan Devi was conferred the award in recognition of her notable talent in the field of Manipuri dance. A student of JN Manipur Dance Academy, Chandan Devi is a diploma holder in Ras and Laiharaoba dance. She received training on other elements of Manipuri dance under Th Babu Singh, Th Suryamukhi Devi, Thauranisabi Devi, Th Chaotombi Singh, N Amusana Devi and W Lokendrojit Singh. She also learnt Thang-ta under G Sana Sharma. Chandan Devi had performed at various national and international level and played lead roles in various choreographies such as Bidai, Meghdoot, Khamnu among others under the production unit of JNMDA. She received critical acclaim for her roles in Manipuri feature films Helloy, Laibak and Nagse Eigini. Another student of Manipur's Kalakshetra Rayanti Rabha from Goalpara, Assam received the Puraskar Award for her notable talent in Theater as an actor. Rabha was trained under Heisnam Kanhailal. 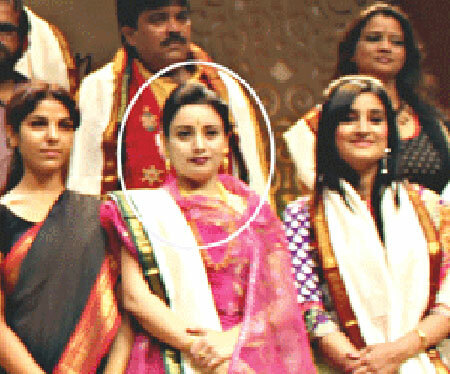 She played major role in Sati, Uchek Langmeidong and Dakghar directed by Kanhailal. Speaking at the function, Leela Samson said that artistes of today live in a skewed and complex times, and that artistes should keep up their aesthetic engagement with the time.